I am reading the book, Ditch That Textbook, and came across how Google would give their employees one day a week, or twenty percent of their time to work on anything they wanted, as long as it could somehow benefit Google. I decided to try the same. I gave my classes one class period and some time at home to come up with a simple project, anything and I mean anything they could think of, as long as it related to some topics I gave them. In my American history class I listed 20 people and twenty events surrounding the American Revolution. They had to pick one of each and start being a “genius”. The results were pretty amazing. I was so impressed with how hard the students worked on these self-chosen projects. They were so into them, that they asked for more time to work on them at home. I came away with the power of allowing students to chose. I am attempting to implement more “choice” into my classroom on a daily basis. The power of choice is ownership. When you feel like you “own” it, chances are you will do all you can to make it as good as you can. I liked it so much I did the same with my Texas history class. The picture you see is from a seventh grade student. 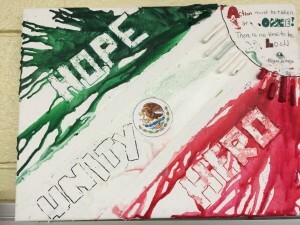 She created this Mexican flag to represent the independence movement, it is great. Give Genius time a try, I think you will like what you discover. PREVIOUS POST ← I’m Back!!!!!!!!!! !